Mechanics are more likely than the average worker to be injured or killed on the job. Daily and frequent contact with hazardous objects and equipment, such as parts and materials and vehicles, represents a higher potential for both fatal and nonfatal injuries. 2005 statistics revealed that from 2003 to 2005, 147 mechanics were killed on the job, with a fatality rate of approximately 5 deaths out of every 100,000 employed, which is higher than the rate of 4 per 100,000 employed for all occupations combined. And there were 15,680 nonfatal injuries and illnesses to mechanics involving days away from work in 2005, about the same as in previous years studied, ranking mechanics 14th in terms of the number of injuries and illnesses involving days away from work. With vehicle components becoming increasingly more complex and computerized, the work of the mechanic has become more high tech and specialized in specific types of automotive repair, with areas of expertise in engine, transmission, brake, front end, or air-conditioning repair, etc. 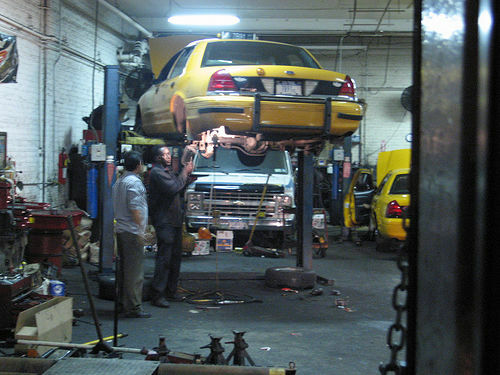 Although many mechanics are Automotive Service Excellence (ASE) certified—a nationally recognized certification program that tests a mechanic’s knowledge every 5 years—and as such excel at their work, it is still essential that employers in the industry provide the safest workplace possible given the high risk of injury and fatality in this occupation. As an example of what happens when employers fail at their job, we find a recent news report revealing that two workers in the Idaho Falls area were killed in separate incidents when vehicles they were working under fell from makeshift supports and crushed them. The incidents occurred within a two-week period and within three miles of one another. A mechanic performing transmission work was killed on January 12, 2015 when the truck he was working under fell from the wooden blocks supporting the vehicle. Two weeks later, an employee of an Idaho Falls-based salvage yard was also fatally crushed when a van fell on him from supporting wheel rims. An inspection by the OSHA’s Boise Area Office found that neither company had basic safety programs or precautions in place. Neither employer took the steps necessary to secure the vehicles to prevent them from falling. Investigators also discovered forklift-related hazards at both locations. For more information click here. It seems pretty obvious to say that the lives of these mechanics would have been spared had the employers of these companies simply taken the necessary safety precautions and implemented basic safety programs at their facilities. One must wonder at the lacking ethics and poor business savvy of the employer who fails to establish a safe working environment, especially when the Occupational Safety and Health Administration (OSHA) make resources and support for establishing such programs readily available. Click here to learn more.